This is a piece that I made for Ana Mendes' performance,'Socket's Markets Exchange' as part of the L'Intru exhibition at Richmix on 12th December 2015. I was one of 7 artist's to be set the challenge of what I would spend my last £7.57 on (following Ian Duncan Smith's claim that he could live on the benefit rate of £53 per week). 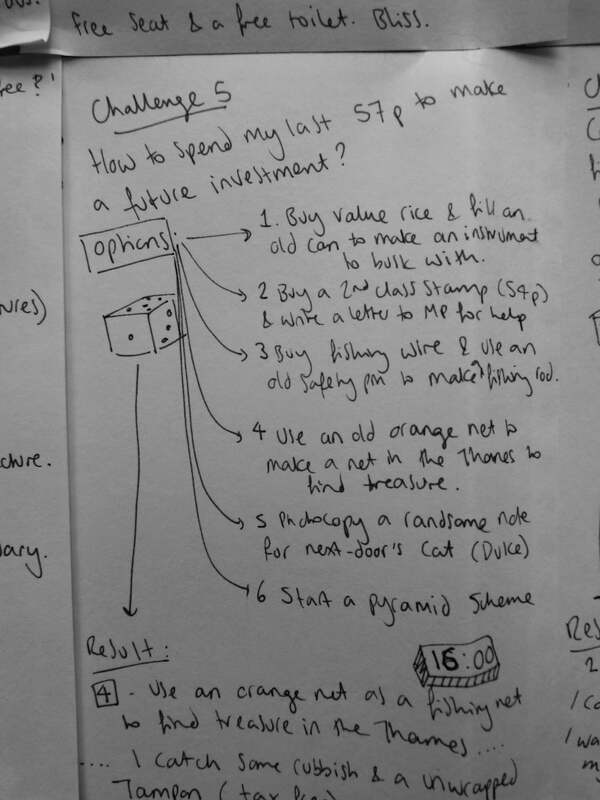 For 'Socket's Market Exchange' I bought a dice which I used to make decisions concerning how to spend my last days. The dice is a metaphor for the human need for rules and systems to contain the chaotic. It also signifies how living in a consumer society alters the relationship between an individual and their perception of choice which is both overwhelming and hermetically restrictive. I devised a series of rules that i followed according to the roll of the dice. The sketchbook documents what happened. These are film stills from Tina Dobrajc's piece: 'Milk/Origin of the World' (2014). I met Tina whilst living in Slovenia and enjoyed collaborating on a few ideas with her. Her work looks at historical, folk and contemporary stories and perceptions of woman within Slovenian culture.